Here are a few thoughts from a recent visit to the University of Pennsylvania Museum of Archaeology and Anthropology. The majority of what I noticed was curatorial. Most of the museum is arranged for a rather passive ambulatory viewer. The current Imagine Africa installation is a major exception to this traditional format. It is highly interactive; if anything, the large suggestion boards spaced every ten feet seemed (at first!) like an almost desperate plea for attention. What changed my mind about this installation was learning that it is a temporary presentation by which the museum intends to assess how best to restructure their collection of artifacts and art from the African continent in order to satisfy the interests and needs of their visitors. The organization of their artifacts into conceptual themes was far more engaging than the traditional country- or time-based format. I was particularly riveted by the short films of indigo dying and resists. The interviews with Maasai men about traditional healing methods is fascinatingly informative without being stuffy. I simply must visit again next summer to see what becomes of this curatorial experiment. The nearby “Black Bodies in Propaganda: The Art of the War Poster” was strong…and disturbing. The show signs vocalize and explain the intuitive unease which the posters elicit. They also carefully and consistently highlight the political motives and ironies for using Africans and African-Americans in propaganda for the French Legion, Communist China, and the US military. Several months ago I produced various coins which used fictional and historical designs on their obverse and reverse. 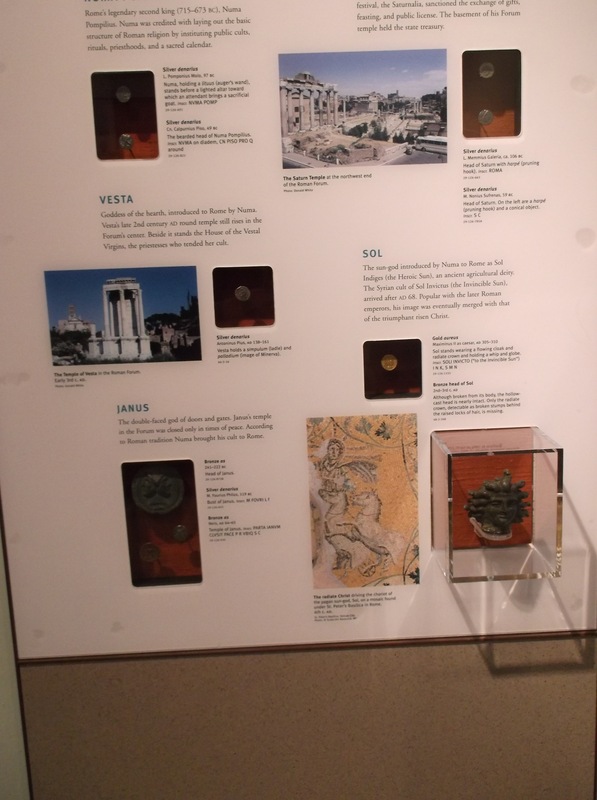 The Penn Museum Greek coin display included five of the numismatic designs I appropriated. Although some of the coins on display showed a mind-boggling amount of tiny detail, I learned that each of my appropriations were smaller than their referents. Thrilled as I was to see real coins rather than photographs, the true take-home lesson was the way these coins are displayed at the Penn Museum. Notice how the dowels project the coins and thereby conceptually separate them from the text on the panels behind them. 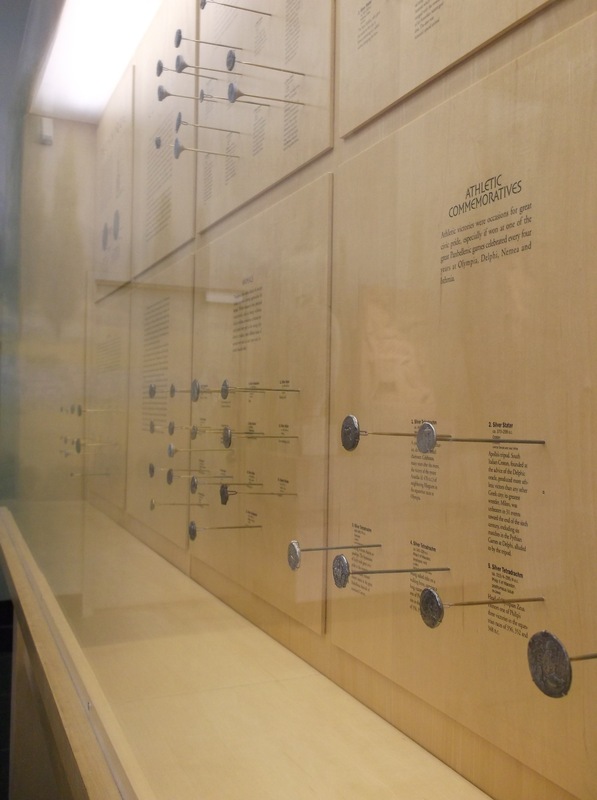 The coins and text are isolated by the dowels while being conflated by their proximity and inclusion in the glass case. Why is this so important? Museum-goers can easily ignore the text in favor of the authentic object (especially if they are either uninterested in detail or exhaustively familiar with it). At the same time, there is no ambiguity about which descriptions go with each coin. This is the sort of opt-in quality of information dissemination for which I am searching in my own recent art installations. In a nearby room they presented Greek coins in a dramatically different manner. Notice how these recessed display panels guide your attention more to the signage than the objects themselves? This display is far more pedagogically focused on making you learn certain historical facts with coins as evidence. Now…how will I use these curatorial ideas in my studio practice? Is this a red herring or an epiphany?